I'm happy to announce today that my latest book, The Bloody Eleventh, is scheduled for release in early November, 2015. It's a companion book to Born To Serve. This book is the regimental history of the Eleventh Pennsylvania Volunteer Infantry as told by the regiment's Chaplain William H. Locke, who wrote the official history in 1867. By the way, they got the nickname "The Bloody Eleventh" for their victory over Stonewall Jackson at Falling Water very early in the war, and were the first regiment to bear that sobriquet as a result of reportedly being the first Pennsylvania infantry regiment to see combat in the war. I took the history several steps further by adding my two cents worth, and over eighty Civil War photos and thirty maps to help the reader follow along with the narrative. The reader can see most of the places where the regiment fought, camped, or marched through, and follow them on the maps to get a feel for the relationship to the other troops. Also included are the many human interest stories that pepper the history. Some of them are humorous, some not so much. You can get a feel for what the soldiers are thinking and care about at a particular time and watch the changes as events occur and time goes by. Those of you who read Born To Serve, know that the 11th Pennsylvania was one of the hardest fighting and most famous regiments in the Army of the Potomac, and saw action at just about every battle in the eastern theater throughout the war and remained heavily involved right up through the surrender at Appomattox. Not only that, they seemed to find themselves in the thick of the action at most of those battles. 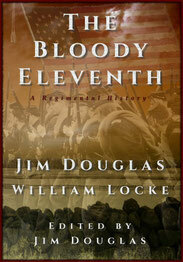 The Bloody Eleventh is easy to read thanks to Reverend Locke's no-nonsense writing style. Not as flowery as much of 1860's prose. That, and the short chapters make this one a pleasure to read either on the go, or settled in for a good read in front of the fireplace this winter. It's been a real pleasure marching along with the men of the Eleventh Pennsylvania and Major Happer in particular over the last four plus years. I hope you have taken the journey right along with me. I have added a bonus picture and map section to the Kindle version, that aren't in the print version. Plus the maps are in full color. Also included is a free, bonus chapter from my first book, Born To Serve: The Major A. G. Happer Story.